"The Perfect Martini," Lee Levine's favorite 34th Street cover. Lee Levine was the Co–Editor from January 1975 to December 1975. My four years (1972–1976) at Penn coincided with two significant events in what, unbelievably, is now the 50–year history of 34th Street. One involved the very real question of whether the magazine would survive at all. The other centered on the less life–threatening, but equally momentous (at least at the time) question of whether it would keep its name. Both are probably worth memorializing for posterity. Accordingly, as Summer turned to Fall that year, he decided he had had enough and resigned, leaving a publication with no editors and very little staff. The DP Board had a decision to make—should we declare that the experiment that was 34th Street had run its course, or should we make an effort to keep it going? Happily, we chose the latter. For the first several weeks (through the end of the Fall semester), we operated 34th Street with The DP’s staff, and Mitch and I served as its semi–secret co–editors (while continuing to hold down our day jobs at the newspaper). Once the semester ended, and we were relieved of our DP responsibilities, we officially became the magazine’s co–editors in 1975. During those close–to–eighteen months, we re–imagined 34th Street, both procedurally and substantively (forgive me, I’m a lawyer). On the procedural front, with very few exceptions, we made the magazine and newspaper staffs one and the same. 34th Street became a vehicle for DP reporters and editors to write the kind of long–form stories that were not feasible in the daily paper, both because of the time such stories took to write and the space they occupied. It turned out that DP staffers welcomed the opportunity to spread their wings a bit. On the substance, we repurposed and expanded the magazine’s reach to include reporting about all things Philadelphia—politics, sports, neighborhoods, and the like. We also re–designed the publication and introduced a series of weekly columnists, from Dan Kastle (C ’75) on restaurants, cooking and drinking (my personal favorite—“The Search for the Perfect Martini”), to Peter Ginsberg (C ’76) on then–Mayor Frank Rizzo and city politics, to Chris Jennewein (C ’76) on Philly’s neighborhoods, to Buzzy (he was “Buzzy” then) Bissinger (C ’76) on, well, Buzzy Bissinger. The “new” 34th Street was surprisingly well–received and widely read. Although the term hadn’t yet been applied to newspapers in 1975, we were developing a “brand.” The 34th Street “brand,” however, was based on the fact that Sergeant Hall, the home of The DP and 34th Street, was actually located on 34th Street (at the corner of 34th and Chestnut to be precise). When, during that same year, the University booted The DP out of Sergeant Hall, which was slated for demolition, and shipped us all up to the no man’s land that was then 40th and Walnut, we had a new problem. Do we change the magazine’s name—to 4015, to Walnut—or do we stick with 34th Street? 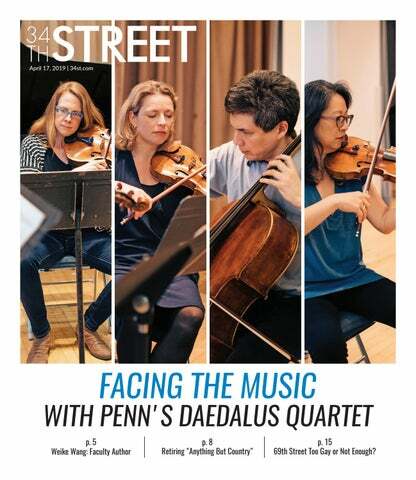 It has now been almost 45 years since we made the decision to “Let 34th Street stay 34th Street” and, in my role as The DP’s lawyer for most of them, I watched with amusement as each new class of Penn students picked up and learned to love what came to be known simply as Street. And, I had to smile when, exactly 30 years after I first walked into Sergeant Hall, my own daughter entered 4015 Walnut, worked as a beat reporter for The DP for a time, found her passion as Street’s Food Editor, and then moved on to a career as a professional journalist, first at magazines and now at Foodnetwork.com. I’m really glad we didn’t shut the thing down! Lee Levine is the Senior Counsel at Ballard Spahr LLP.